State Rep. Martin Walsh, and City Councilor John Connolly, were the top vote getters out of 12 candidates in the preliminary election on Tuesday, September 24, 2013. According to unofficial returns, Walsh topped the field with 20,838 votes, while Connolly came in second with 19,420. The general election, which will be held on November 5, 2013 and will likely turn on the candidate that can appeal to a very diverse electorate. “To come in as the top vote getter is a testament to the kind of open, honest and issue oriented campaign Marty Walsh is running. His background as a state representative, his service to the community, his expertise in the construction trades and his appeal to all working men and women, give him broad based support within the city. 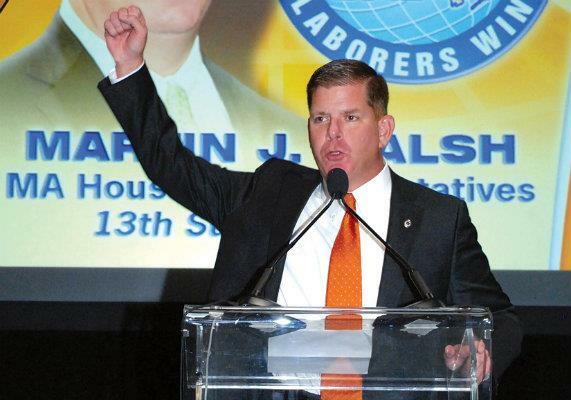 Voters in every neighborhood and in every ethnic group can relate to Marty as one of their own, a hard working guy who cares about the future of Boston.” said Armand E. Sabitoni, LIUNA General Secretary-Treasurer and New England Regional Manager.